Also quick question...would anyone be interested in Animal Crossing Styled commissions? :3 I had fun doodling this, of course it'd be neater than this. I wouldn't mind doing a few of these, the price would be 5$. Note me if anyone is interested! This is sooo amazing i'm finding it hard to put into words. 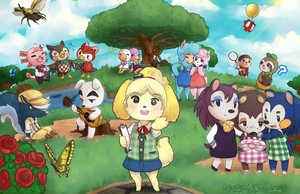 You really have a cute style of Animal Crossing.